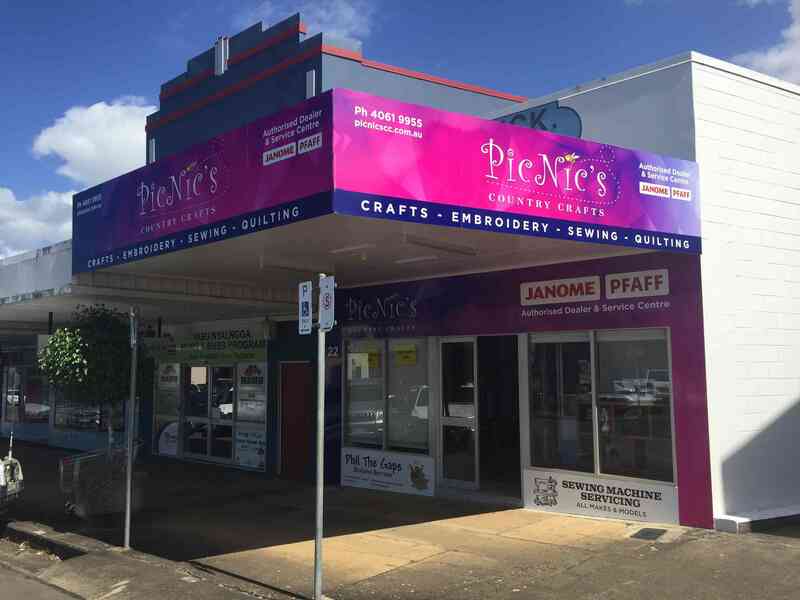 Welcome to Picnics Country Crafts. Located in Innisfail and part of the Cassowary Coast here in Far North Queensland. We are the authorised PFAFF, Janome and Brother sewing machine dealer and service centre here in the far north. It doesn’t matter what sewing machine or overlocker you have our fully qualified technician services all brands and can get your machine back on track. Are you thinking of buying a new sewing machine or overlocker. Come in and talk to our friendly staff and arrange a demonstration on one of our fantastic machines. We always have great deals on our range of machines and we are sure we can find the right machine for you. At Picnics we stock a large range of fabrics and haberdashery to meet all sewing needs. We also have wide and diverse range of threads for sewing, quilting, overlocking and embroidery. Our service department specialise in repairing and servicing PFAFF, Husqvarna, Brother, Janome sewing and embroidery machines and overlockers. But don’t worry if you have another brand we can service that as well. On site servicing is available for those large multi needle or industrial machine that can not be moved. If you live in the Cairns, Atherton Tablelands, Mission Beach, Tully, Cardwell or anywhere north of Mackay we can get your machine sorted. So if you live out of town or you are just super busy with sewing? Well we offer a booking service where you can book your machine in for a same day service as long as parts are not required. Bookings must be made 5 days prior to the service date. If you are going to bring your machine in for servicing please remember the following. We always try hard to get your machines back to you as soon as possible but in most cases you will need to allow between one and two weeks. I know you dont like to thread overlockers. Do you fight with your overlocker every time you break a thread. If this is you then have a look at the new Janome Air Thread 2000 Overlocker. Our new online shop is now up and running and is open for you to purchase. We are still adding products so if you can not find what your looking for please contact us. If you are looking at purchasing a new sewing machine online from us please contact us for the best freight deal. As at the moment the freight prices vary depending on where and how we can get it to you. We currently have limited stock posted in the online shop however we are always adding to the range. If you have something that needs to be repaired or altered? We can help. Repairs generally only take a few days to complete. We also have dressmakers available if you are looking to get something made for that special occasion. While we try and keep our website up to date we sometimes have flash specials that we only display on face book. If you want to keep up to date with new and exciting items the moment they are released add us on Facebook today. We run classes all year round here at Picnics. Please keep an eye on our Whats On page or add us on Facebook to keep up to date on our classes. Specialty days are held through out the year where you will get updates on new and exciting products. On these days we provide morning tea and you will get to have a chat to other ladies as well to find out what they are working on.